Moderator Elisha Kasinskas (left) questions in-plant panelists Panelists Dwight Blackwell, Shaw Industries; Christopher Donlon, Kohler Company; Bruce Goodman, State of Wisconsin; and Joe Kalinowski, Hanover Insurance Group. 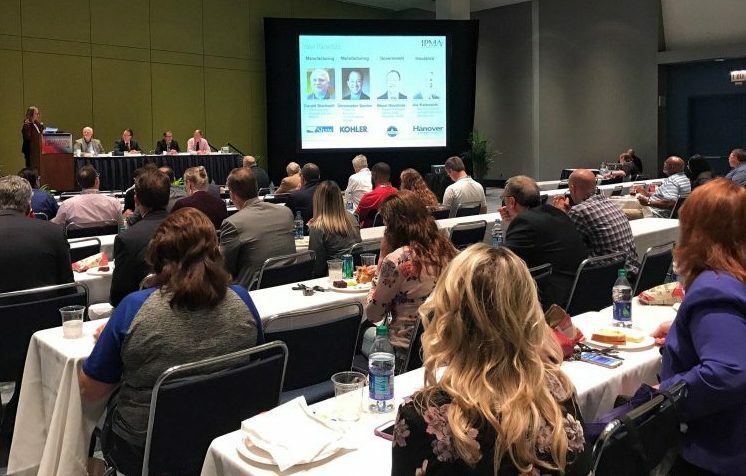 I recently moderated an in-plant session presented by the In-plant Printing and Mailing Association (IPMA) with a panel of in-plant managers who shared their thoughts about being front runners. Panelists Dwight Blackwell, Shaw Industries; Christopher Donlon, Kohler Co.; Bruce Goodman, State of Wisconsin; and Joe Kalinowski, Hanover Insurance Group discussed why and how they are leaders, what makes them poised to win and how they showcase their wins. There was consensus from the panelists about why they are front runners, including the ability to know and predict customer needs and then using that understanding to purchase equipment to meet customer needs. Shaw Industries quantifies and measures everything that it can, using that data to make decisions and drive priorities around equipment purchases. Kohler’s Donlon also looks for equipment to fill customer needs, and he pays attention to the firm’s marketing strategies so that he can that fill those needs in-house without direct costs to the brands. In-plants watch the panel discussion. Photos by Jan Portwood, IPMA. At Hanover, Joe Kalinowski and his managers seek out knowledge and technology to find better ways to accomplish tasks. An example Kalinowski gave was using an innovation (developed for them by RSA) and a workflow process that is saving the insurer significant time by automatically simultaneously populating indicia and shipping systems and compiling and householding agent mail. This combination has eliminated the need for a team of people to sort print output, given Hanover tremendous postal savings and eliminated mis-sorting and mis-keying mistakes. The State of Wisconsin measures its success by the increase in new customers and additional projects with current customers. Kalinowski showed the audience his scorecard — offering to share it and exchange information with other in-plants — revealing that the operation is saving $800,000 a year compared to if it was an outsourced operation. In discussing how they are poised to win, the panelists cited how they use change, innovation and meet customer needs before the competition does. The Shaw in-plant operation runs itself like a business with a P&L. It measures and publishes its savings and has made change part of its culture. Donlon keeps an eye toward the future, reviewing quarterly what the in-plant can do to improve, and he “really pays attention to what's going on around our campus,” noting that he had just found out that a manufacturing plant shift might make a new home available for his shop. Goodman feels that in-plants must be innovative just to survive. He finds ideas from working with other in-plants on panels, being part of IPMA and attending conferences, and then validating the ideas with customers. The panelists all showcase their wins internally, using a variety of communication vehicles ranging from newsletters to open houses and tours, to special employee events. The State of Wisconsin recently created a video that shows what happens in the shop over a 30-day period and embedded it on their website (see: https://det.wi.gov/Pages/BPAD-Home.aspx). Shaw Industries publishes its cost and time savings first to its associates, so that employees can see its contribution to the company, and then publishes the wins to each business unit. A recent key win that Blackwell highlighted was the CIO telling Blackwell that he has taken a back-office department and made it critical to the success of the company. For Donlon, sharing the in-plant's wins — particularly its In-Print awards — provides a testament to the shop and the company about the products and the types of marketing it is doing for customers. Watch for my article about the session in the January/February issue of In-plant Graphics. To hear all the panelist insights, watch short videos from the panel session at: http://bit.ly/FRunPP18. Elisha Kasinskas is Rochester Software Associates’ (RSA) award-winning marketing director. She is responsible for all marketing, public relations, social media and communications, and community building for the firm. Ms. Kasinskas joined RSA in 2010. She is a marketing veteran with more than 20 years of experience in sales, product management and marketing in leading product and service business-to-business and business-to-consumer firms, including Pinnacle (Birds Eye) Foods, Level 3, HSBC, and a number of regional high-tech firms. She holds an RIT MBA and a BS, Marketing from Radford University. Kasinskas is a frequent moderator for industry speaking sessions, an in-plant blogger, and has received industry awards including the IPMA Outstanding Contributor award. She was an OutputLinks Women of Distinction class of ’15 inductee. Her marketing work with IPMA has secured multiple awards from the American Marketing Association (AMA).